Today, Thursday, January 24, 2019, an historic event occurred in our beloved homeland: the transfer of power between Joseph Kabila and Felix Tshisekedi at the palace of the nation. The bulk of the population appeared disinterested in the pomp and pageantry. Mostly members of Felix's political party showed an interest. If it was the people's candidate who was being inaugurated, everyone in the capital city of Kinshasa would be rejoicing. 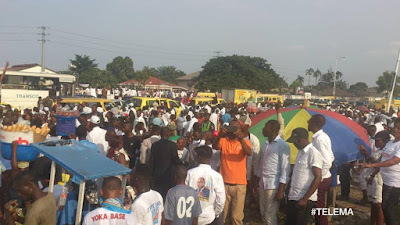 However, the lack of widespread joy did not prevent the members of the Union For Democracy and Social Progress (UDPS) from celebrating in Limete (district in which the party is based), by sipping drinks and jumping with jubilant joy. Congolese continue to make tremendous sacrifice for total independence and liberation from tyranny. The youth have been at the forefront of this fight. During the past few years, Congolese youth have paid the dearest price in confronting the tyrannical regime of president Joseph Kabila. Throughout 2018, Congolese youth rose up to demand democracy and justice in the Congo. Unfortunately, several of them paid the ultimate price for demanding change under the repressive regime of Joseph Kabila. 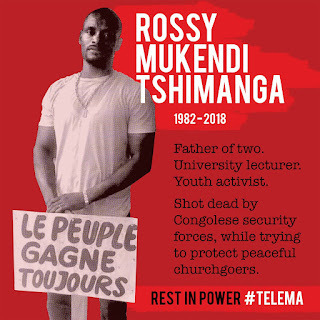 Figures such as Rossy Mukendi, Therese Kapangala, Luc Nkulula and many others are martyrs of the pro-democracy movement in the Congo. Courageous Congolese continue to make enormous sacrifices for a better future for the sons and daughters of the Congo. As Congo enters 2019, Congolese youth and the broader Congolese society are still pursuing peace and democracy. They are demanding that the Congolese government and the broader African and International community respect the will of the Congolese people following the December 30, 2018 elections. Click here to get the latest updates on the post-election demands of the Congolese people. The Congolese people, who are growing suspicious of the maneuvers of the Independent National Electoral Commission CENI in acronym, were awaiting the results of the elections of December 30, 2018 when the Congolese government shut down the internet across the country. For the majority of the population, this move confirms the bad intentions of the government in complicity with the CENI. 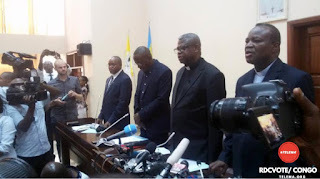 On the same day, while the DRC government was cutting the country’s internet services, the Secretary General and spokesperson of CENCO (Catholic Bishops Conference), Fr Donatien Nshole, intervened to make a partial presentation of the electoral process throughout the Democratic Republic of the Congo. Nshole announced that they received 17,023 reports on voting operations, meaning informations of 78, 22% voting centers throughout the Republic. Through its reports the CENCO declares that the general climate of the voting process was relatively calm. In several polling stations the CENI respected the closure of polling station procedure. The CENI relaunched voting operations where the vote was interrupted. Polling stations, it says, worked relatively well. - Observers and witnesses have been excluded from certain counting centers. The General-Secretariat of CENCO says that it remains in constant contact with the CENI and all stakeholders in order to find solutions to the mentioned incidents. - 2,839 reports attest that the polling results sheet was displayed at the end of the count, but 342 attest that the voting results sheet has not yet been displayed. "The General Secretariat of CENCO asks the Congolese people to remain calm while waiting for the results to ensure the credibility of the results. The General Secretariat of CENCO asks the CENI to pursue any action ensuring the process transparency, the display of the manual counting results at the polling stations, the identification of the Local Compilation Centers of the CLCR Results, and to provide observers access to these centers. The General Secretariat of CENCO congratulates the government for ensuring the smooth functioning of the Internet. I am sorry to learn just before entering the room that the internet was cut. Unfortunately the message was already signed, thank you! During the Mass of the first day of the year, the Catholic Church of the Democratic Republic of Congo preached about the birth of Jesus Christ, referring to the book of Luke chapter 2, verse 18 to 24. The homily delivered at the end of the Mass referred to the current situation with regard to the elections in the Democratic Republic of Congo and underscored the need for vigilance. The position of the Catholic Church puts the regime of Kinshasa in a very difficult and uncomfortable situation. On one hand CENCO holds the credible results of the elections and on the other hand it calls to civil mobilization through the idea of vigilance. We all know that the Catholic church, through its Lay Committee ( CLC- Lay Coordination Committee), is the biggest and the strongest mobilizing force in DRC. 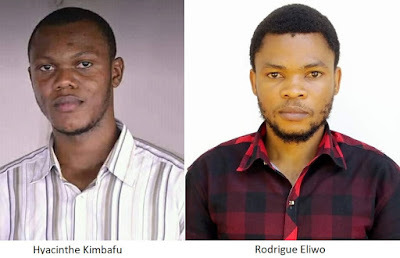 They are the ones, following three marches of protest in 2017 and 2018, who managed to obtain of the regime in Kinshasa to organize the elections of December 30, 2018. The Catholic Church has the regime of Kinshasa over a barrel!